Info "Finally! I get the respect I deserve!" Super Wario is one of Wario-Man's microgames in WarioWare: Twisted!. 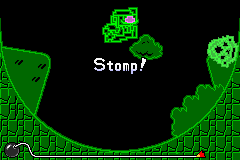 The player must turn the Game Boy Advance to make a Super Mario Bros.-esque block-like Wario to stomp enemies. If the Game Boy Advance is turned upside-down, it will cause Wario to fall. Level 1: Wario must jump on an idle Koopa Troopa shell. Level 2: Wario must stomp on a slow-moving Goomba. Level 3: Wario must stomp both a Goomba and a moving Koopa. This page was last edited on September 20, 2018, at 09:33.